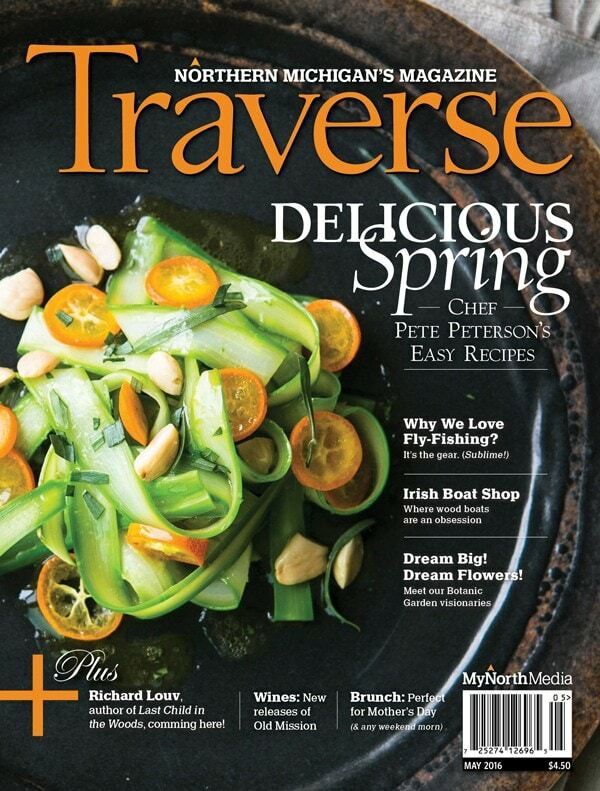 Renowned Traverse City Chef Pete Peterson shares some of his favorite spring dishes with Traverse food and wine editor Tim Tebeau including this asparagus salad recipe. Find more spring recipes by Pete here. In a medium bowl, whisk together the kumquats, shallot, ginger, honey, olive oil, and vinegar. Season with salt and pepper. Cut kumquats into 1/8-inch-thick slices. Stir together 1/2 cup sugar and water in a small heavy saucepan. Bring to a boil over medium heat. Reduce heat to medium-low, and stir in kumquat slices; simmer 10 minutes. Remove from heat; and let the slices cool in their syrup. Prepare an ice water bath, and line a cookie sheet with a towel. Bring a large pot of salted water to boil over high heat, add the asparagus and quickly blanch, just two or three minutes. Immediately drain and put asparagus in ice bath. After a minute or two, transfer asparagus to the towel-lined sheet. With a very sharp potato peeler, or mandolin, thinly slice the asparagus the entire length of the spear. This can be tricky, so diagonally sliced pieces of about 1 1/2 inches long will work as well. Carefully toss the asparagus strips with the chopped tarragon and desired amount of the kumquat vinaigrette, and artfully arrange on salad plates. Garnish each plate with a few of the candied kumquat slices and the tossed almonds. This recipe by Pete Peterson was originally published in the May 2016 issue of Traverse, Northern Michigan’s Magazine.